-->> ..after they were abducted by the cosmic-transport cowlick, Cudley and taken to the Stump Asteroid.. the guys; were sans weapons. The big Cow head stored the weapons in his gooey cheeks. 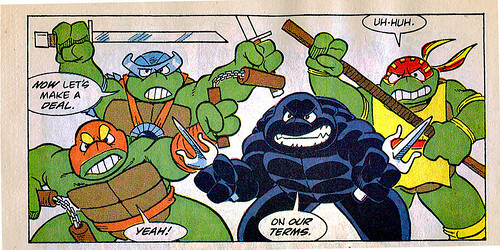 The Turtles were forced by the greedy aliens Stump and Sling to wrestle before they could be taken back home. But when Cudley accidentally belches up the signature ( and now slimy weapons ) weapons.. the tables and the wrestling match drastically turns in the Turtles' favor ! !